for the best fan letters! I am a Nick Diunte fan. The praise doesn’t end at fine writing. If Nick was a prospector, the other guys panning for gold would never see him. Suddenly, he’d appear with news of the mother lode. As a baseball researcher, he finds treasure where no one else is looking. I wrote to Gail Harris about two months ago asking to talk with him about his time in New York. 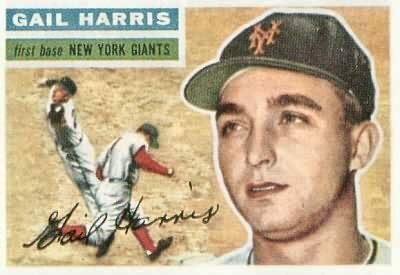 He sent me back (at his cost) an envelope filled with photos (some autographed) and a few photo copies of some typed stories he had about playing for the Giants. He told me to e-mail or call him. I waited about a month because I had a few other things in front of it I had to get to. I e-mailed him at the end of October with no reply. He didn’t return my phone call either. He passed away on the 14th of November, so I am sure he was too sick to get back to me. Something must have hit him quickly. Anyway, as your encourage on your site, write to guys when they come to mind. Harris gave a Hall of Fame response. Enjoy it. Coming Friday: Saying goodbye to the son of a legend.